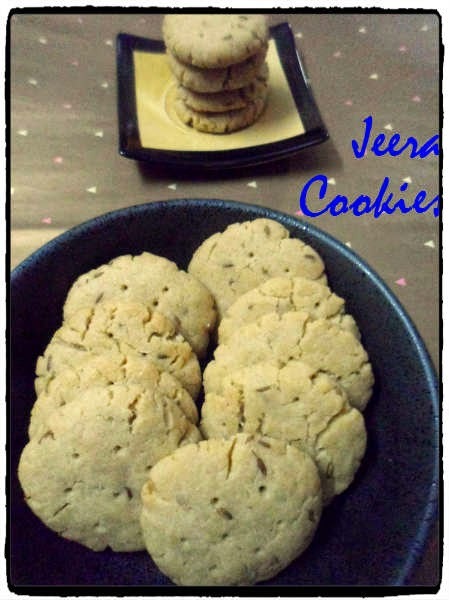 Jeera Biscuits are savory biscuits that are lightly salted and seasoned with cumin seeds. This is an all-time favorite snack at my home with a cup of coffee or tea. 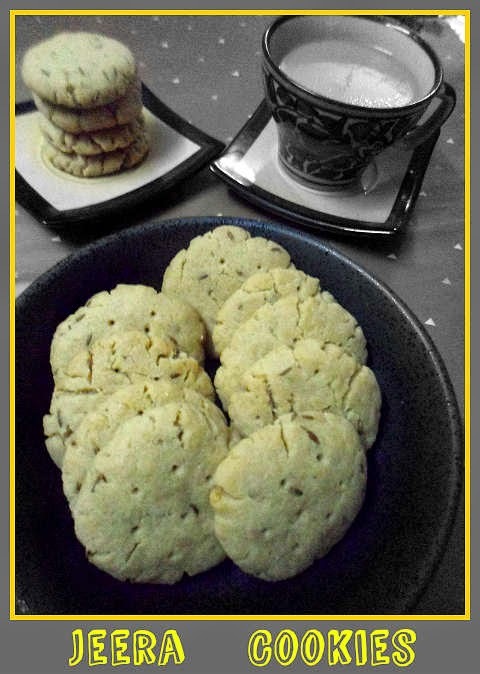 This is an easy-to-make recipe, which is butterless, therefore totally harmless and yummiest cookies of all. Our whole family love these cookies, even my kids. 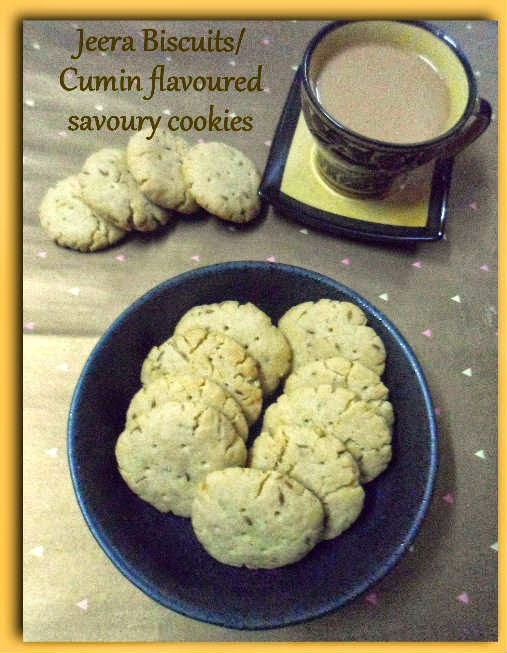 The best thing about this cookie is with just few ingredients which are very regular in our pantry, you can create magic and enjoy these savoury cookies with a hot cup of tea or coffee. Cumin seed : 2 tblsp. Pre-heat your oven to 180 degreeC or 375 degreeF. In a bowl, take both the flours, salt and baking powder, give a good mix. Add cumin seeds then and mix again. Set aside. In another large mixing bowl, mix together sugar and oil with a hand beater, add beaten egg and mix well. Now add the flour mixture little by little into the egg mixture and mix. Add 2 tblsp. of water or milk and knead into a soft dough(little tighter than you chapati dough). Divide the dough into equal portions. Roll each portions into a ball and then flatten them on your palm and give a round disc shape. P.S. : Flatten them little more than in the pic. The more thinner the cookies, more crispier they will be. Grease a baking tray with little oil and dust it with flour. Tap the baking tray and discard the excess flour. Place the prepared round cookies on the baking tray. keep a little space in between and bake for about 12-15 minutes or until cookies are lightly brown. Remove from oven and transfer the cookies/biscuits on a wire rack and cool completely. Store in an air-tight container. Do not over bake the cookies. Not more than 15 minutes, cookies may turn hard. Cookies will be more crispier when they cool down. Store in an air-tight container after they completely cool down and enjoy them.